What is The Battery Life Saver electronic desulfator? It’s an electronic device that reconditions, maintains, and can rejuvenate old “dead” lead-acid batteries. 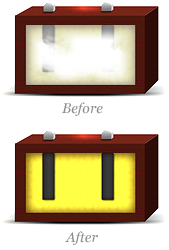 It will maintain functioning batteries in a like new condition, extending the life of the batteries. It is a U.S.A. product that can double or triple the normal life of the batteries. Why do you need the The Battery Life Saver electronic desulfator? 80% of lead acid batteries fail prematurely because of the buildup of lead sulfate crystals on the battery plates. This buildup causes the battery to become unusable at approximately one-third of its natural life. The Battery Life Saver electronic desulfator dissolves this buildup, keeping the batteries in an optimal condition. The Battery Life Saver electronic desulfator solves the battery’s problem of the build up on their plates, lead sulfate that accumulates in a crystal form that is very much inert. With our technology each crystal works as a radio receiver. In fact, when Marconi (or Tesla) invented the radio, he used a lead sulfate crystal for his receiver. The Battery Life Saver electronic desulfator is like a small radio transmitter. Using breakthrough square wave technology, it sends a radio signal to each of the lead sulfate crystals energizing them and causing the necessary conversion back to lead, lead oxide and sulfuric acid. This action gradually restores the battery back to its original condition allowing the battery to store and release charge again. What are benefits of using The Battery Life Saver electronic desulfator? The effectiveness of a desulfator is a function of its power output and the ability to stimulate a broad spectrum of frequencies. The Battery Life Saver electronic desulfator has fins for cooling because the electronics need the cooling fins to handle its high power output. No other desulfator puts out this much power. If you see a similar device housed in a plastic box, be advised that it cannot possibly be powerful enough to be effective. Because of the square wave technology, The BLS excites the broadest spectrum crystal frequencies possible. This is your assurance that the BLS will effectively maximize your battery performance. The Battery Life Saver electronic desulfator is not a toy made of plastic! It is made of durable corrosion resistant anodized aluminum. It will not break if dropped or hit. The electronics are encapsulated for weather proof protection and durability. What if a battery has a shorted cell? The Battery Life Saver electronic desulfator will NOT fix a battery that has a short or open cell! You can test for a short or open cell by performing the testing procedures found here. When replacing a battery that is part of a multiple battery bank, replace all of the batteries at the same time. Otherwise, the older batteries will pull the new one down. However, if you have been using The Battery Life Saver electronic desulfator you can get away with replacing just the bad battery.